This was one of those beautiful, chaotic moments in nature where you feel both overwhelmed and at peace with the colors, textures and the cold breath of the season. Mother Nature is truly an artist. Let me start by saying, I’m not a “water” person. I’m definitely an “I like my feet to be on solid ground, where sharks and alligators can’t eat me” kind of person. I am also an “I almost had a panic attack while kayaking the other day” when my friend pointed out a snapping turtle in the water near us. That being said, as much as I love being dry, I am drawn to be close to the water. It’s a powerful, beautiful force of nature and it makes a great addition to most photos. Being at Niagara this weekend reminded me of how incredible, impressive and intense water can be. There is a spot on the American side (in the Cave of the Winds) where you can stand under just a sliver of the Bridal Veil Falls. The water slams into your skin, and the wind from the falls pushes you around on the deck – it is an experience that always takes my breath away. As I walked away from the Bridal Veil this weekend, I turned to my friend and explained my feelings about water. I don’t love the idea of being in it, but boy do I respect it. And I love, love, love to photograph it in its various forms. In fact, in the next few blog posts, you will definitely see some photos from the weekend. But first…! Today’s photo is one I’ve been sitting on for a few weeks. 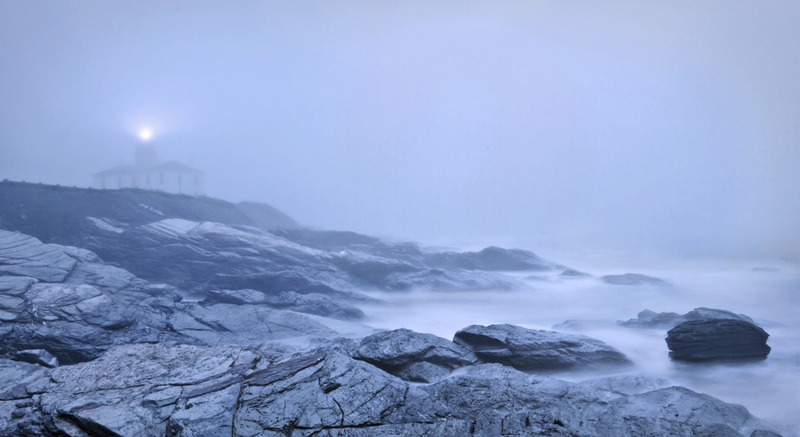 It wasn’t what I envisioned when I drove to the coast in Rhode Island to take photos. I have hopes of a colorful sunset on the horizon, rock formations in the foreground, leading lines, and somewhere in there, a lighthouse. What I got was fog. And some crazy powerful waves. And lots of wind. And raindrops on my camera lens. And dangerous footing. And about an hour of reflection – when nature acts up, it reminds me that we are just small (but mighty!) creatures in a gigantic (amazing, beautiful, wonderful!) world.